You’ve probably heard the term “aging in place,” since it is fairly common on radio, TV and the Internet. But, you may not completely understand what it means. Aging in place is a term used to describe living in the home of your choice for as long as you are able as you grow older. During this time, you are able to get any help or support you might need. Most people hear that and they think, “Yeah. I want to do that! I’ll just stay in my house until I have to move.” That sounds good, but in reality, it hardly ever works out like you think it will. Why? First, because your home is only one part of aging in place. And, second, your home (or most any home) was not built to be easy to live in. It wasn’t designed to keep you (or anyone) safe. And, it certainly was setup to meet your needs as you grow older. The truth is, most every home ever built in the U.S. was designed in a way that would be easy to live in and use for the average 20 year old person. And, it was never thought of to make it be easily accessible. So, the reality is that most homes are not designed to support you in the various stages of your life (not just your later life; any stage) and you’ll most likely have to remodel your home over time. As we get older, things change for us; our bodies, minds, abilities, needs and priorities. What is important is for us to recognize that these things will happen and prepare for them, so we can maintain a life of dignity and comfort as we continue through this stage of our life. For example, some of the physical changes people frequently experience could include vision reduced, less muscle strength or endurance, reduced hearing or less mobility. Thankfully, there is something that you can do about that. You see, the whole idea of aging in place is about personalizing your situation so that you get what you need later in life, while still being able to have the freedom of choice and lifestyle. Part of that personalization can happen in your home. Specifically, making changes to your home so that it enhances your life now and prepares you for later on. These changes would be to modify your home so that it is easier and more safe for you to live in, while giving you greater control over your life as time goes on. A common misunderstanding that people have is that this idea of aging in place is for old people. Although it is understandable how people could think that, it really isn’t the case. The truth is, no matter if you’re 40 or 74, we all are aging in place. This whole concept is designed around planning and creating. Essentially, carving out the situation that is going to help you keep creating a life that is meaningful for you through the rest of your life at home. It’s very personal. It also is not about being sick or feeble or having a home that is ‘institutional’ looking. Just the opposite; it’s about you taking action that is going to help you create a beautiful home that can keep you healthy and happy at home for longer. We understand just how personal aging in place is. We’ve watched as our own family members have made plans for their lives and helped hundreds of people do the same. We work with seniors, Veterans or families. Safe Living Solutions is a home remodeling contractor in High Point, with the knowledge, experience and skill to help you understand, plan for and implement changes in your home. We offer the highest quality home accessibility products and home design services. The accessible team at Safe Living Solutions also have the training to back up their experience. 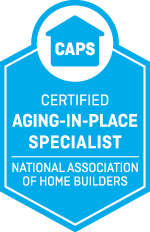 Not only do they have several Certified Aging in Place Specialists (CAPS) on the team, but several also hold other designations or certificates, such as Certified Home Assessment and Modification Professional (CHAMP) and Certified Environmental Access Consultant (CEAC). This training, along with their years of experience in creating accessible homes for our clients that will support them later in life, gives us the unique ability to help our High Point neighbors achieve the goals they have for aging in place.